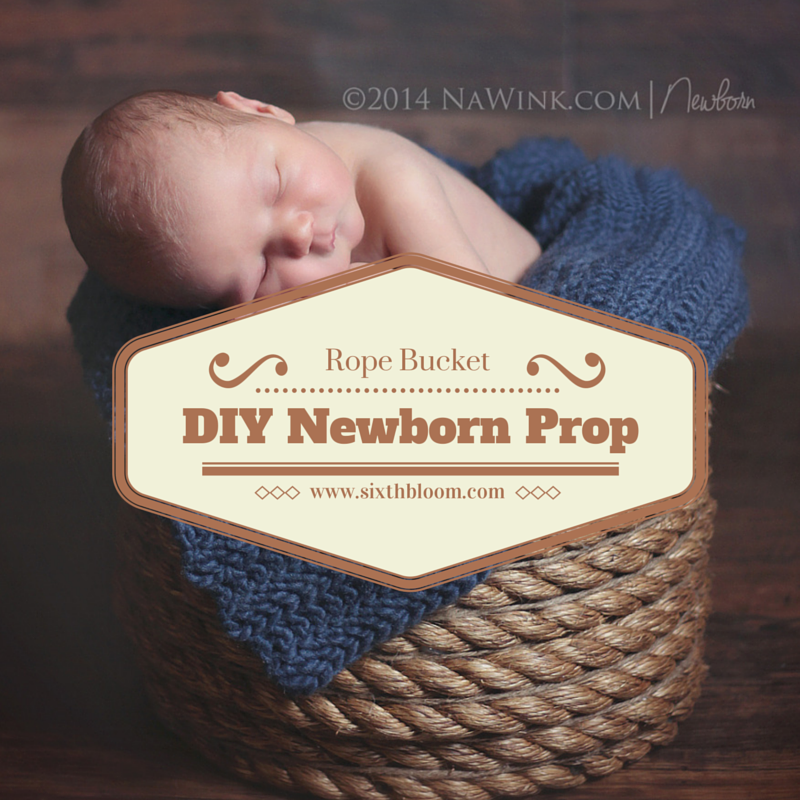 This is a more difficult prop to make, so don’t attempt to make it at ten o’clock at night before a newborn session! – 39 foot rope (13 yards or 12 metres) that is 1 inch diameter. 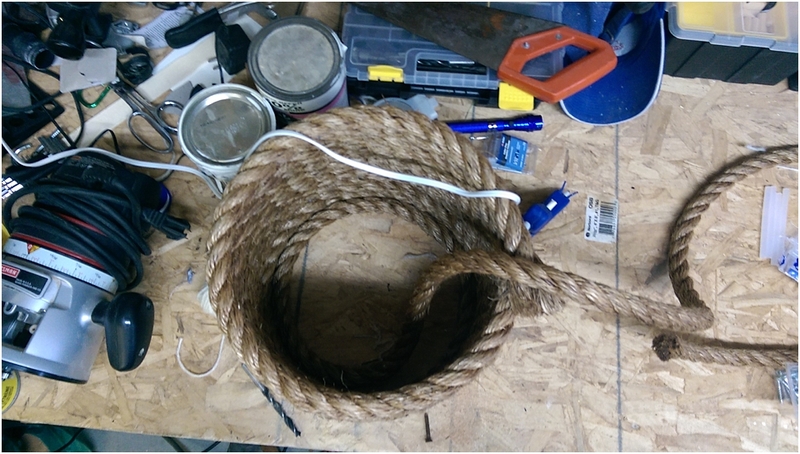 Step 1- Start by wrapping your rope around the pail ( think I used a 10 gallon pail but I’m not sure). 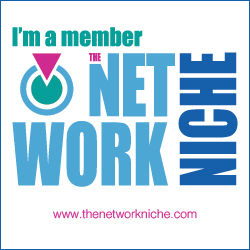 When you get around to where you started, take a screw and screw it from one strand into the other to keep it in place. Just make sure your screw doesn’t go through the bottom! 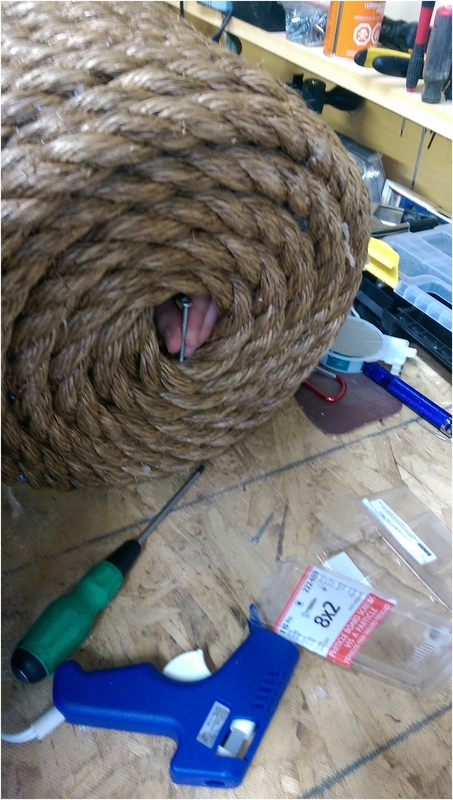 Step 2- Use the hot glue gun to go around the rope between the layers. 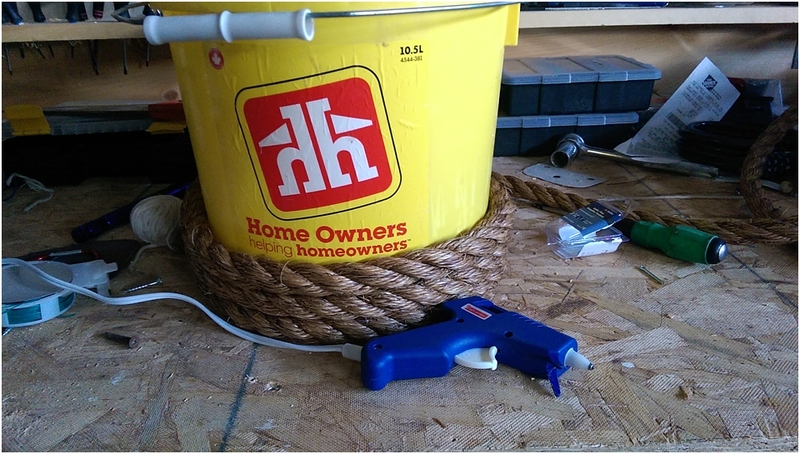 Reinforce the rope using screws as you go around. I used about 1 screw every 4 or 5 inches all the way around the bucket. 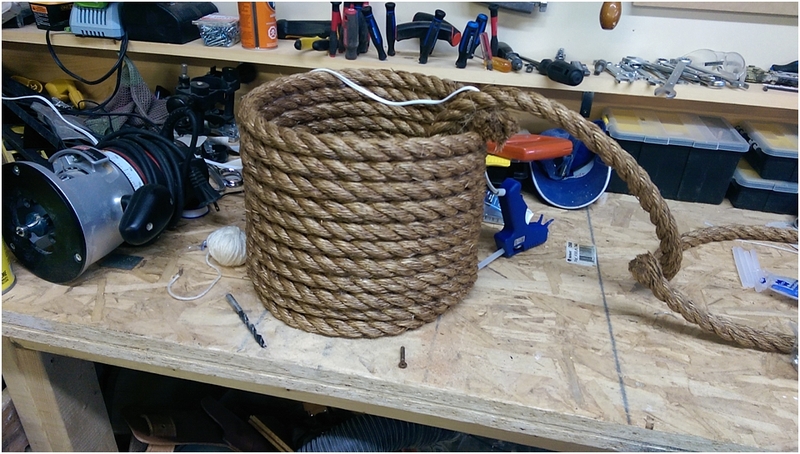 Step 3- Keep wrapping the rope around the bucket, gluing and screwing as you go up. 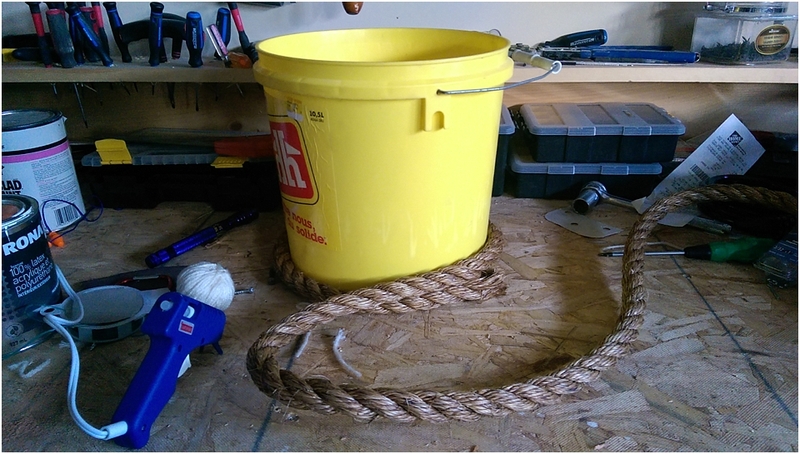 Step 4- When you get about 12 inches up, pull the guide pail out of the rope bucket. Flip your rope bucket upside down so it will now be upside right. (did that make sense?) 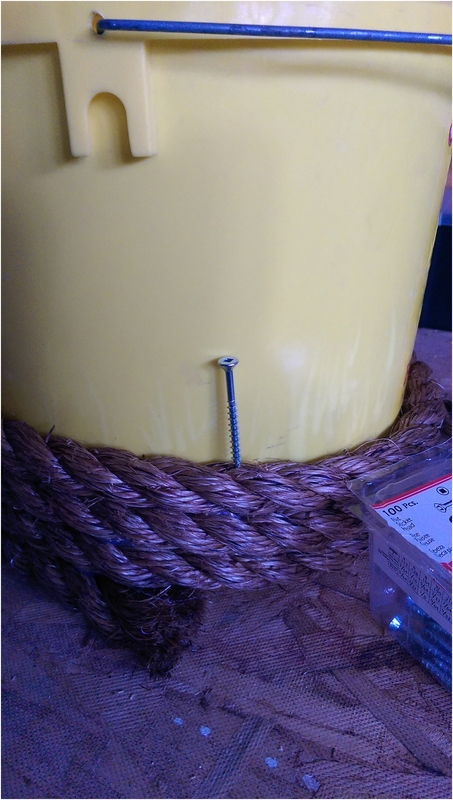 Make a spiral in the bottom of your bucket and use lots of screws and hot glue again. Step 5– Screw a long screw into the center of your spiral to keep it from unraveling. 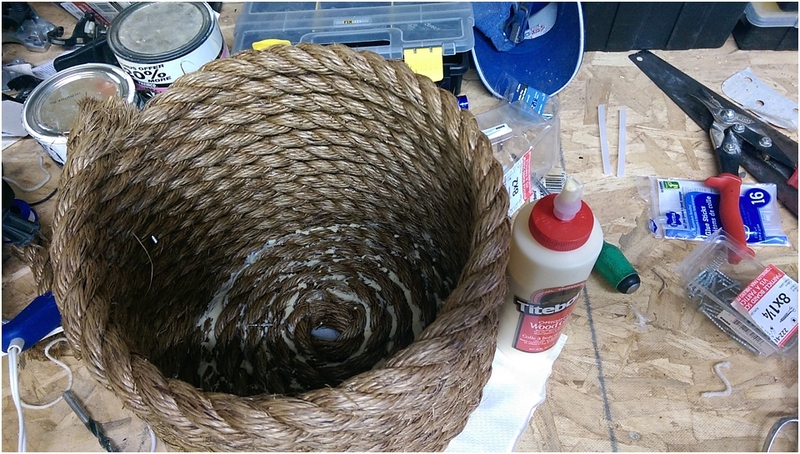 Step 6- Use the wood glue all around the bottom spiral. Make sure you use a drop cloth or paper towel under your bucket since the wood glue will seep through the bottom. 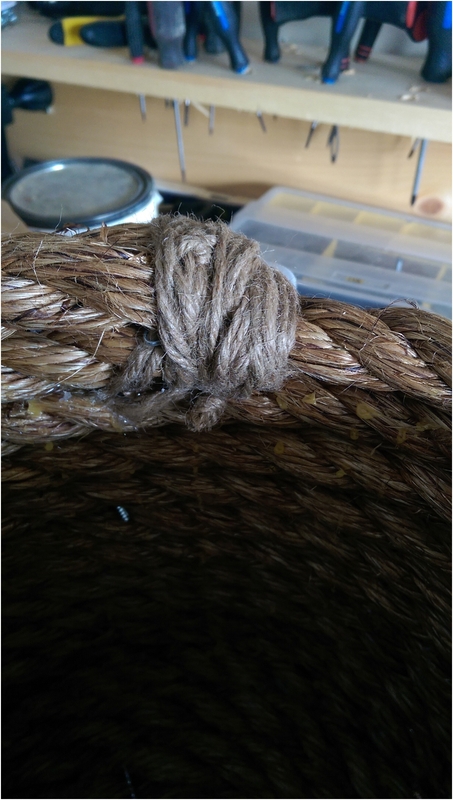 Step 7 – After everything has dried (I waited a day to do this part) use the twine to place between the rope layers to help hide the hot glue spots that show through. 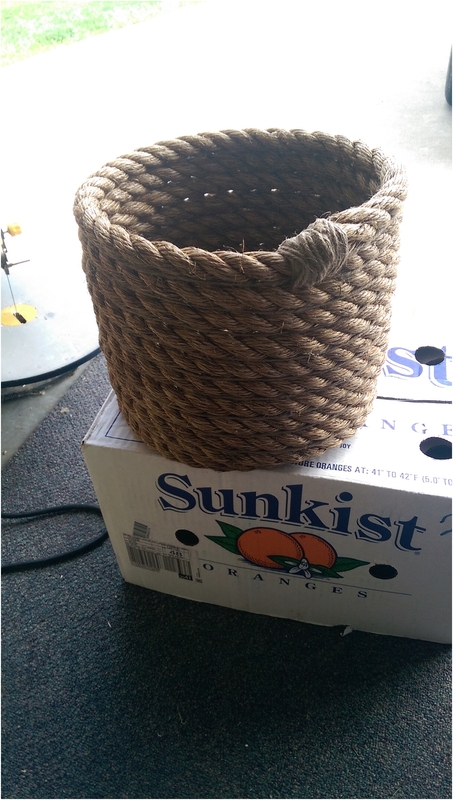 I only hot glued the top and the bottom of the twine and just wrapped it tight enough so it won’t move. 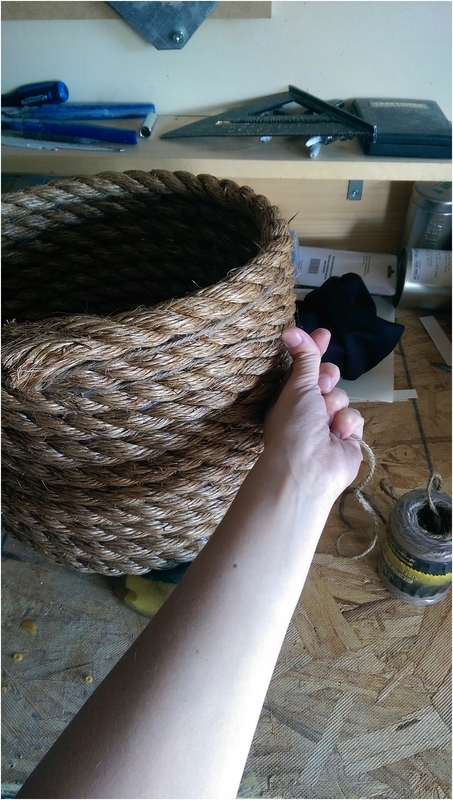 Step 8- Use a really big needle or a cotter pin to thread twine at the spot where the rope bucket started and hot glue in place on the inside when done. 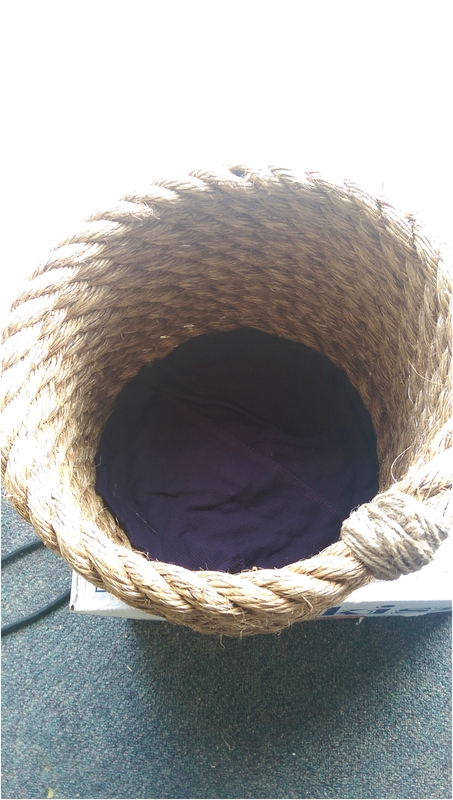 Optional – Hot glue a piece of fabric on the bottom of the inside of the bucket if you have any places your blankets or basket stuffers can get caught. 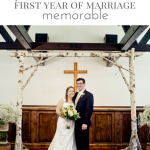 This is so resourceful and beautiful! Wow! Impressive and that baby is too cute. Great job. 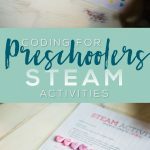 Such Great fun ideas! 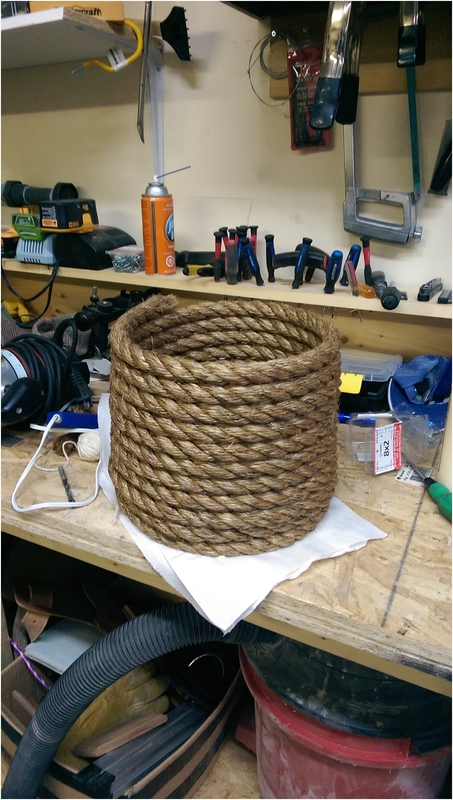 Lovely the creativity of the rope bucket. Excellent idea and very crafty too. 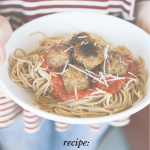 It seems to be fairly easy to make (minus the prickly fibers) and definitely has multiple uses. 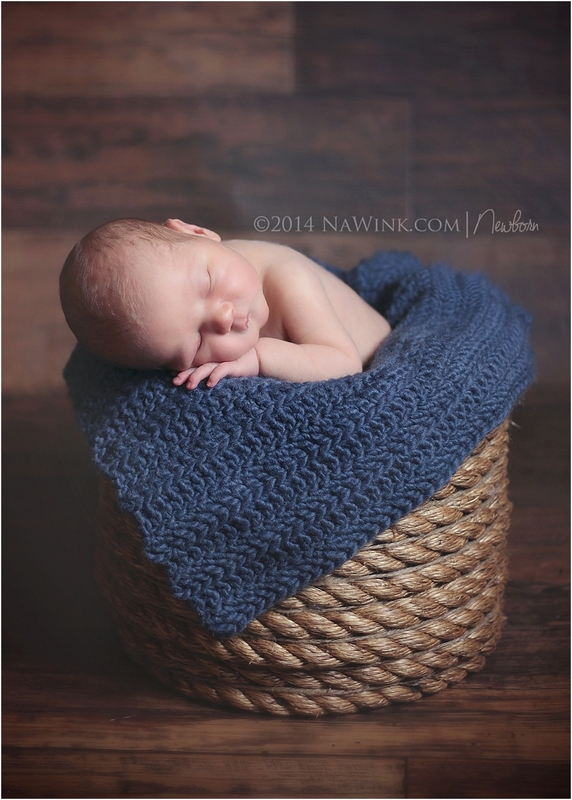 The photograph with the baby and the craft is just stunning. What an awesome basket! Thanks for the great tutorial. 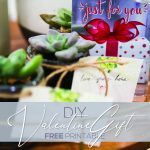 I’d love for you to share this project at my Show Me Saturday party. My readers would love it! So impressive! 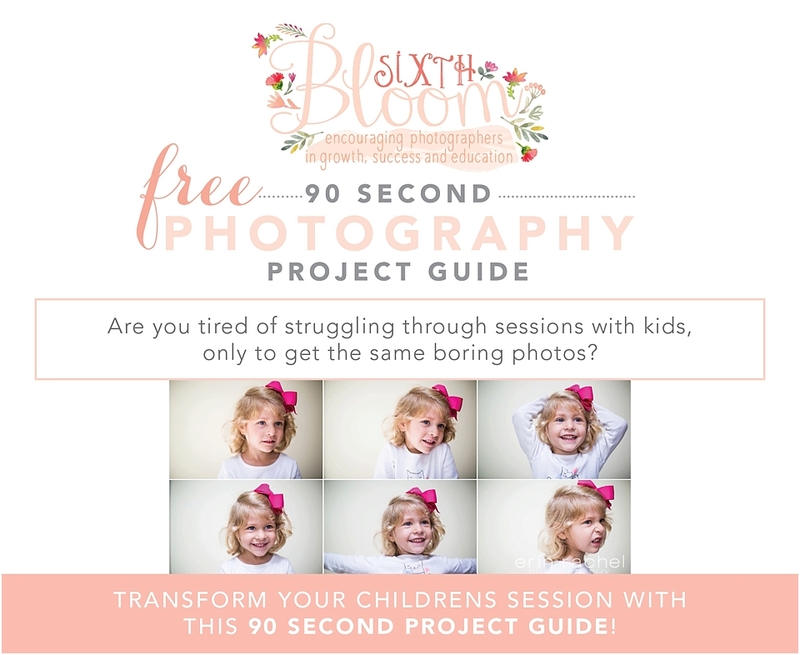 I am just starting with babies/newborn photography and thinks like this are my life savers! Especially my wallet. AMAZING!